Rubbish picture taken from the plane. a very staccato, quick post to get things going. Met up with Nerys and Brenda, the TV producer and photographer who are also covering LearAsOne’s first project, at O Tambo airport before flying up to Livingstone. Another score on the seat front – using online checkin SAA let me select a business class seat. Unexpected upgrade FTW. Bottom left. Weirdest looking thing. 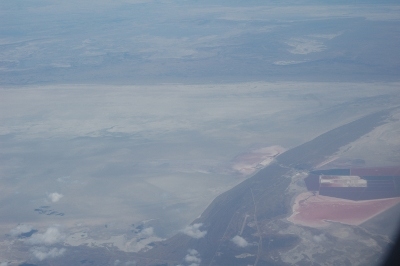 Some remarkable scenery on the flight up – huge swathes of smooth, white desert with large, man made splashes of colour breaking up a landscape which otherwise looks like the oceans have only just retreated, and might be back this afternoon. Livingstone itself is much smaller than I expected. 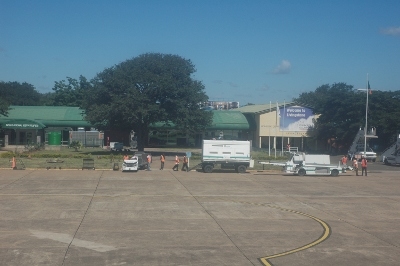 The airport is very basic – ours’ was the largest plane on the tarmac by far. It’s so quite, passengers literally walk from the end of the aircraft steps to the terminal building. This afternoon has been spent planning the coverage for the next week. Steve’s been here for a week already, so knows his way around fairly well and has met quite a few people. 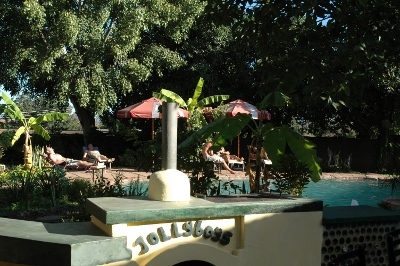 Tonight, we’re staying n a backpackers hostel called Jollyboys – about five minutes drive from the airport. It’s quite well equipped: full of travellers, other volunteers visiting Victoria Falls and even another journalist who writes for Sky’s travel website. Tomorrow we’re meeting Haakon from Response Network at 10am to drive up to Kalomo. It’s only 120km, but the roads aren’t great from what I’ve been told. Haakon’s work sounds very interesting – I’m looking forward to talking to him about it in the car. Fingers crossed 3G starts to work. We have a connection, but can’t access any sites, so I’m hoping it’s just Sunday and there’s no-one at work to reboot MTN’s modems.